I was recently discussing with a friend one aspect that’s highly controversial in the disability community: identity-first vs person-first language and the politically correct way to talk about people who are disabled. Here at Aulexic, we’re very careful about our wording in regard to disability. Because the truth is, we don’t want to have a narrow focus to only help people who identify as having a learning or developmental disability. A lot of the time, someone may have trouble reading and writing but don’t have a diagnosis. So we want to be inclusive of all people who have challenges with language and literacy, regardless of their disability status. And more importantly, we understand that having a neurological difference in the way we learn is only disabling in environments that demand we learn the way literacy-dependant schools teach. For those of us who do identify as a person with a disability or a person who is differently-abled there is a lot of controversy around how we identify and the politically correct way for people who are not disabled or differently-abled to refer to us. I’d love to take a few minutes today to share my own insights into this argument. I’d also like to share why I personally proudly claim identity-first language in most cases (but also why I don’t always). The distinction between person-first vs identity-first language (ie. “person with dyslexia” vs “dyslexic person”) is very much a debate between disability vs difference mentalities. Many dyslexics (and autistics or aspies) embrace the difference mentality and wear their neuro-difference with pride. In fact, there is clear correlation between having a positive mindset about being dyslexic/autistic/aspie and the ability to thrive and succeed in the world. There are many wonderful benefits and traits that come with these neuro-differences and it’s important to reinforce these in a positive way. While dyslexia (and autism), do create disability because of our existing social standards, they are a neuro-difference not a suffering or disease. In fact, most learning disabilities are ultimately to do with neuro-difference rather than disability because it is an array of traits. We have weaknesses in some areas but these are usually compensated by relative strengths. For example, I may experience difficulty with working memory so find learning by rote challenging but I find it very easy to contextualise experiences and to extrapolate and predict future outcomes based on past history and statistics. So, in school, where reading is the predominantly demanded skill, a dyslexic child may experience “disability” when trying to learn about the solar system because the information is provided in written text, but if you take away the written text and give that same child other modes of acquiring the information about the solar system they won’t have any problem at all learning about it. It’s the societal expectation and the heavy demand on our weakest skills that create disability. I like to use more concrete examples of disability where people can “see” the impact more significantly. In fact, there’s this great image I found on the web that shows it in a very visual sense. Take a look! So, this is a picture of three people. They are all different because one is tall, one is medium, and one is short in height. They’re all differently-height-abled. Being different heights is not considered a disability. You don’t get height-disabled but there are definitely advantages and disadvantages in our society influenced by our relative heights (as someone who is 5’2 aka relatively short I can attest to the many disadvantages). But, back to the picture. In the picture our three differently-height-abled people are all trying to watch a ball game. The stadium has a fence of a particular height. For the tall person this is no problem at all, their world works really well, the fence does not cause them any problems. But the short and medium height people are confronted by a barrier to their viewing. They are not able to watch the game. They are dis-abled. 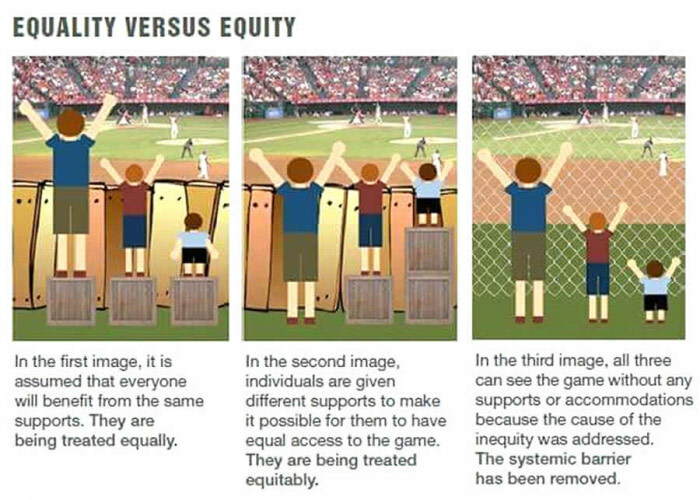 Now this particular picture talks about equity and equality because the world isn’t built to allow inclusion. The fence causes an exclusion against height-challenged people. So, we provide an accommodation; in this case a box to stand on. And because people want to demand everything be fair and equal everyone gets one box. For the tall person getting this box doesn’t really serve them at all. They didn’t need it. They could enjoy the game without the additional height. In fact, additional height could even make it more challenging because they were already pretty tall. But now the medium height person can see the game so it’s great to have the box. But the short person still can’t see the game. Everyone has been treated with equal rights, but the short person is still dis-abled from seeing the game. That’s where equity comes into play. Now, to be fair rather than giving everyone exactly the same treatment, we give them the accommodations they need to be able to have the same experience as other people despite their differences. This is great! Now, the tall person who didn’t need a box doesn’t use one, the medium height person has one box so he can see over the fence. And the short person has two boxes and can see over the fence. Everyone can experience the ball game in the same way. That’s equity. Equity is great, we want equity. But ultimately, what is not being taken into account is the fact that we could eliminate the disability entirely by removing the barrier that existed in the environment. After all, the short person isn’t “height-disabled”; except he IS in situations where being short is a disadvantage. A truly inclusive environment would go beyond equity and eliminate the barrier so that the difference is never a disability in the first place. That brings us back to the identity-first vs person-first language. Person first considers that a person is first themselves, but they also have a disability. Identity-first acknowledges the awesomeness of our difference and our community within the greater environment. After all 20% (1/5th) of the world have learning differences. That’s not so unique and different after all. We’re part of that community, part of that tribe. Just like being part of the short people tribe or the tall people tribe or the medium height people tribe. So, yes. I’m a proud dyslexic person, rather than a person with dyslexia. My very special son is both dyslexic and autistic and I’m very proud of him. His neuro-differences are part of what make him the wonderful person he is. And he keeps very good company in our community of fellow dyslexics and autistics. There is no shame in his difference. Where this gets tricky is in situations where we really do feel like our difference is a problem. For example, yes, I am dyslexic, but I also a person who has bipolar affective disorder. On my good days when I appreciate bipolar as the neurodifference that it is I think “I am bipolar”. But because bipolar results in some really horrible days full of dark depression and anxiety there are often times when I wish I wasn’t bipolar. On those days I think of myself as a person who is suffering this terrible disability. And I think that’s a key factor in this argument. And I think that’s the most interesting part of this discussion about identity-first vs person-first language. Commonly, neuro-typical people (particularly scientists who are trying to “cure” or “fix” our neuro-differences, and parents or teachers who are struggling to cope with and understand them) are often the ones to favour person-first language. After all, their mindset is that there is something wrong with us and if we could just get rid of dyslexia/autism/bipolar the world would be a better place. A large majority of neuro-divergent adults, however, embrace their neuro-diversity and love who they are. Removing dyslexia or autism or bipolar, means fundamentally changing who they are and eliminating the things that make them themselves. We aren’t looking for a cure, we’re looking for a more understanding world that can accept our differences rather than expect us to suppress them. A world where there is equity, or in a true paradise where the barriers within society that disable us simply don’t exist. Lets build chain-link fences that everyone can see through regardless of their height. Or bringing it back to an example with language and literacy difficulties, an environment when learning and education incorporate truly multi-sensory approaches and adapt to the learning styles and strengths of every student rather than depend so predominantly on skills where inherent weaknesses in 1/5th of the population create this sense of disability.